No, you can’t. Well, you can, but you can’t. Let me explain. I have a friend that came up with a system for generating leads from YouTube. It doesn’t really matter what the system was because it does’t work anymore. The first time they put it up, they brought in 40,000+ new leads to their email list in just a couple of days. So many leads that their auto-responder service provide called them up and was going to suspend their account because of fake signups. Fortunately, they managed to convince them that they were trying something new and legitimate. A list of genuine email addresses collected in an organic way and properly followed up with is worth between 50 cents and $1 each per month on the average. And they properly followed up and made the money that can be expected from a list of that size. So, that’s $20,000 per month, starting to come in a few days after they started. They didn’t start out on day one, come up with this idea and start making money. They built a number of other lists first. They already know all the basics of how to build a website, a landing page, a lead magnet, a good auto-responder followup sequence. They know how all the systems work. They knew how to followup and build a relationship with the leads they got. They had a good relationship with their email provider. That took years to build. They were an overnight success, after 4 years of hard work. They didn’t buy the technique from anyone. They sat down, thought outside of the box and came up with something they thought would work and then tested it. And this one happened to work spectacularly. Many don’t, but this one did. Ok. My friend had a great system. What do you think he did with it? Do you think he immediately turned it into a product for sale to tell others how to do it? Would you? He used it and used it and used it. He cranked the handle of his money making machine until the handle wore off. Then, when it started to get harder to make money with it, THEN he decided to make a product. And of course, he pitched that product to the appropriate list and made a bunch of money with it. He had great proof that it worked because he had made a ton of money with it. The trouble is that by then, the system was getting burned out and didn’t work like it did in the beginning. It might work well enough for a buyer to feel they didn’t waste their money (If they were one of the few that actually implemented it after they bought it. Most don’t.) And that is assuming, of course, that the person who bought it already knew how to do the technical stuff that I talked about above. It certainly wasn’t going to work anywhere near as well or as easy for anyone who bought it as it did for my friend. You might consider buying some systems to see how the work, And to think about how they might have worked at an earlier time. The most important thing is to help you learn to thing up ideas that will work before everyone else gets to them. But if you think someone is going to sell you a money printing machine, you’re just wrong. 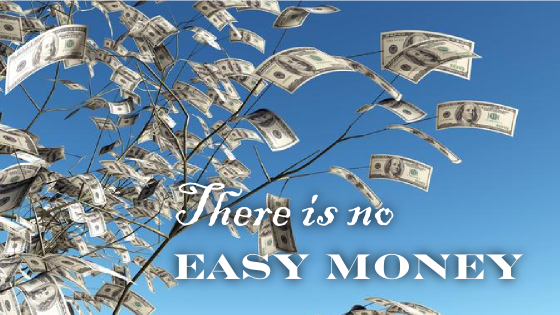 If someone has a system that is making easy money, they aren’t going to sell it to you. It takes experience and work to put a system together, even if someone gives you the framework. Easy money comes only after a lot of hard work. So, stop chasing easy money and start working to build your niche. Try to understand how to think up clever ideas. When you come up with one, test it out quickly. If it works, milk it for all its worth until it runs out. Its not easy money, but it can be big money if you put in the work. And look, I gave it too you for free. What’s the one big thing?